Currently enrolled UACCM students have access to NetTutor for online tutoring. This service is provided free of charge to UACCM students. 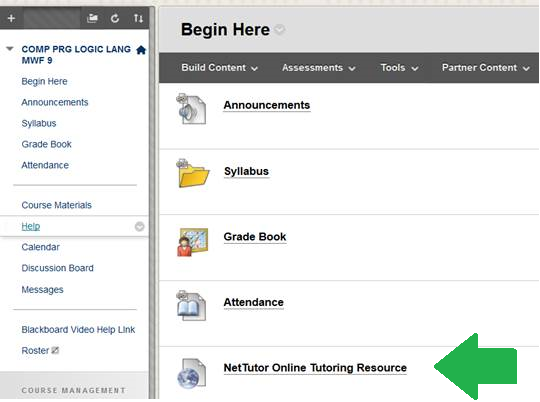 To access NetTutor, log in to your UACCM Blackboard account, select one of your courses, and on the "Begin Here" page click on the "NetTutor Online Tutoring Resource" link (see screen below). For more information about NetTutor, visit our NetTutor information page. 3. Log in with your username and password (your password is emailed to you immediately after you create an account). 4. Select your subject and type of tutoring. Your paper needs to be double spaced. Save your paper as a PDF document. You will receive an email notifying you when your paper is ready to be picked up. Students can connect to NetTutor 24 hours a day, 7 days a week. They can either choose to continue with a Live Tutor and get connected immediately, or submit a question to our Q&A Center. The purpose of a Live Tutorial session is to provide immediate assistance to students to clarify and explain any method shown during class. The goal is to highlight the strengths as well as the areas in which students can make improvements and solve similar problems on their own in the future. When students join a Live Tutorial Session, they will enter a One Queue-Multiple Servers queuing system in which they will have a short wait until the next tutor is available. This allows less waiting time, first-come-first-served, one student per session, with total privacy from, or sharing with, other students waiting in the queue. A NetTutor tutor will ask the student to type or copy and paste the entire problem and/or all the work thus far, regardless of the accuracy; this is to provide enough information toward solving the problem. The tutor’s goal is to determine the exact need of the student. Using the tools on the whiteboard, such as different colors, lines, arrows, etc., and to guide the review process, the tutor will point to issues by asking pertinent questions that will lead students through a cognitive process to further develop the correct methods, steps, formulas, etc., and to come up with their own answers. In the typed comments, the tutor shows empathy, makes helpful suggestions, and will continue to explain the method until students are capable of finishing the exercise on their own offline, or find the solution. In no case will the tutor give the answer or solve the entire problem without the participation of the student. If the student is reluctant to answer the questions asked by the tutor during a Live Session, or if the tutor faces a student who has many weaknesses, the tutor has the option to provide a different example or a lower level problem, in order to show the student the basic steps needed as requisite toward a solution. Tutors will respond to the question within 24 hours. Students will submit the question along with any work done toward the solution (including graphs, figures, tables, etc.). If there is no work submitted, the tutor may ask the student to resubmit the question along with the work done to that point. The tutor will review the issue and provide written suggestions that will help guide students to the correct solution. Students will receive notification that the question has been answered via an email message. The student should connect to NetTutor and retrieve the session saved in her/his personal archive. Students can submit papers asynchronously to the NetTutor® Paper Center 24 hours a day, 7 days a week. They can signal two main goals and any additional information on the NetTutor Paper Submission Form that informs and guides the tutor to a more tailored and appropriate response. Paper Center tutors will review and return papers via the same interface. They will provide feedback by writing comments within the paper and by providing a review summary. Their response will be expressed in contextual mark-up that is over-imposed on the original text. In the review summary they will encourage students in their writing efforts by recognizing the strengths of the piece, and by making helpful suggestions that focus on the individual needs of each student. Students will receive email notification when their papers have been reviewed. The reviewed papers will be held online, and students will access NetTutor to retrieve them. Tutors will superimpose comments on the student’s paper, and/or will ask the student pertinent questions to guide the review process, so that he or she may further develop the thesis, the content, and the ideas in the paper. Tutors will not “fix” any grammar issue for a student; rather, they will provide a brief explanation so that writers may fix them on their own. Students can also go online to the NetTutor link, and enter a live board to ask a tutor for any explanation of the markings on their papers or issues related to writing in English. Students can take screenshots of the paper to drag and drop onto the canvas, or drag and drop the entire reviewed PDF document so that tutors can see to what the student is referring. In no case will the tutor rewrite a paper, paragraph, or sentence, although an alternative form of expression may be suggested as an example of improvement the student may be able to make. When faced with a writer who has many weaknesses, tutors typically comment on only the first instance of a repeat issue, and will let the writer know that they've focused on one or two major things. They tell the writer that their feedback isn't attempting to fix or mark up everything in the paper. To the degree possible, improvements made by students in a resubmitted paper will be recognized and reviewed with additional feedback. Having technical issues? Submit a Customer Support Request through NetTutor. For more information about NetTutor, contact Rebecka Virden at virden@uaccm.edu or 501-977-2033.